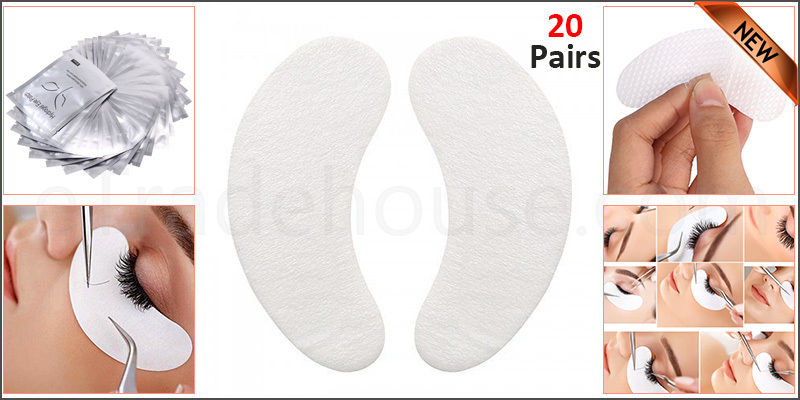 20x Pairs Gel Eye Pad Patches. Custom Fit for all eye shapes and sizes. Active Ingredients Includes: Water, Glycerol, Aloe Extract and Vitamin C.
Used to Moisture and Tighten Skin. Remove Dark Circles and Wrinkles. Also used for Eye Protection when applying Eyelash extension. Multiple Uses Like Eyelash Extension Application, Facials, Eyelash Perming, Eyelash Tinting or just use it to reduce dark circle, eye puffiness. Suitable for Professional Makeup Salon, Cosmetics Studio, Makeup Artist. Professional use and personal use. Keep Out of Reach of Children. If Swallowed, Get Medical Help or contact Poison Control right away. 20x Pairs Gel Eye Pad Patches Eyelash Extension.